My Saturday evening of gaming with Metropolitan Wargamers was a busy one. First, I faced off in a 20mm World War II scenario on one of the club’s sand tables, and then I played in a three-player game of Lords of Waterdeep. It was standard fun stuff on a rainy quiet night in Brooklyn. The surprise of the evening was when one of the guys pulled a box off the shelf and asked if I wanted to play a ten-minute game. Now, most the games I’m used to playing easily take a minimum of 60-90 minutes to play, so I was more than curious as to what this mystery game might be. The game is Tsuro, and it’s one of those magical games that is both easy and complex all at once. 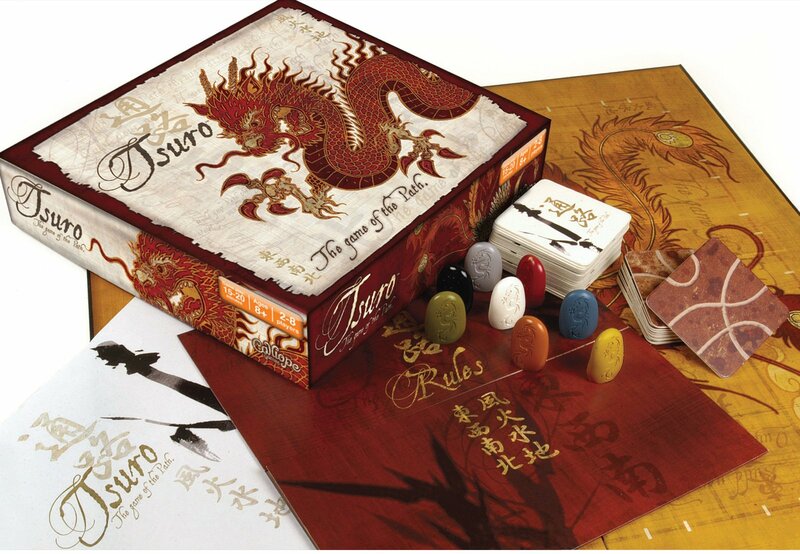 Tsuro has been around for about 10 years but the game has a feel and design making it seem a part of some ancient Far Eastern culture. It’s subtitled “the game of paths,” and that’s it in a nutshell. Each of the 2 to 8 players take turns placing square tiles on the board’s grid and moving their pieces along the linking paths. When newly-laid tiles touch other player’s pieces, those players also slide their pieces on the ever-changing linked, criss-crossing and overlapping paths. The object is to keep your piece from getting routed off the edge of the board. The last player on the board wins. I played a couple three-player games of Tsuro in rapid succession. The turns go fast, and I can see how a game played with even more people could turn into a dizzyingly-quick game as pieces slide every which-way on the board’s paths. The game has nothing to read, nothing to count and incredibly simple rules, so I could see this as a fun game for families after dinner or with a few friends on the coffee table on a Friday night. For another look, check out Wil Weaton’s Table Top for an episode with his friends playing Tsuro and some other quick dice games. Tsuro proves that a game doesn’t have to take all day or have a zillion pieces or complicated rules to be a blast.